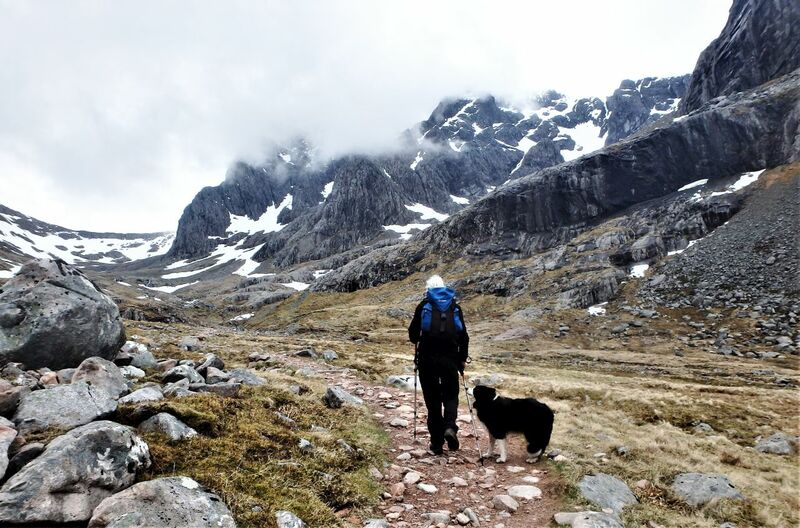 May in the Scottish Highlands is often the best time of year for a visit, with fairly settled weather and no midges, which is why we were back this year for the third year running. 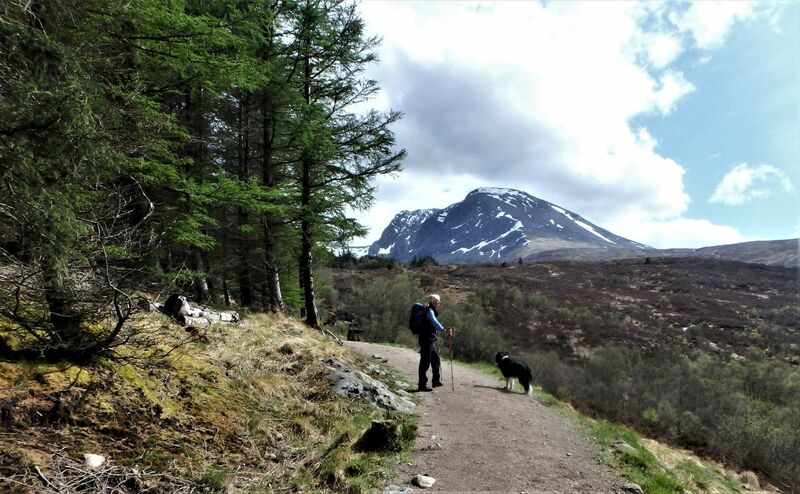 For most of our hill days, Chris and I (plus Border Collie ‘Mist’ of course) walk the routes together, with a couple of longer, more mountainous days for me and the dog. 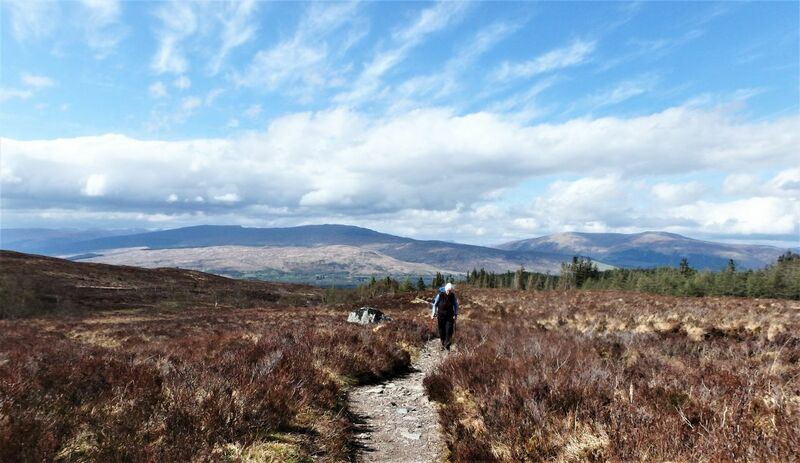 Although the weather had been ‘fairly settled’ on our way north, we didn’t hit the trail until we reached Fort William. 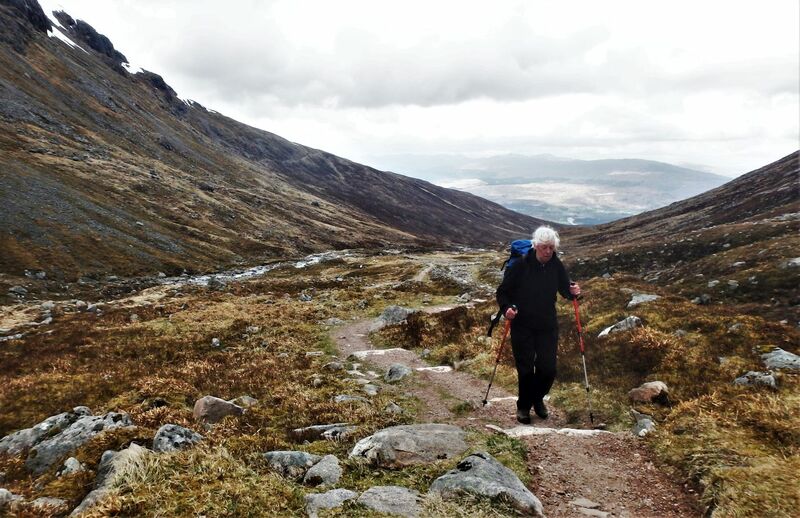 Regular readers will know that Chris doesn’t go for steep, pointy mountains anymore, but there’s plenty to go at in the mountains without risking life, limb or sanity – a walk up the CIC hut below the North Face of Ben Nevis seemed to tick all the boxes. 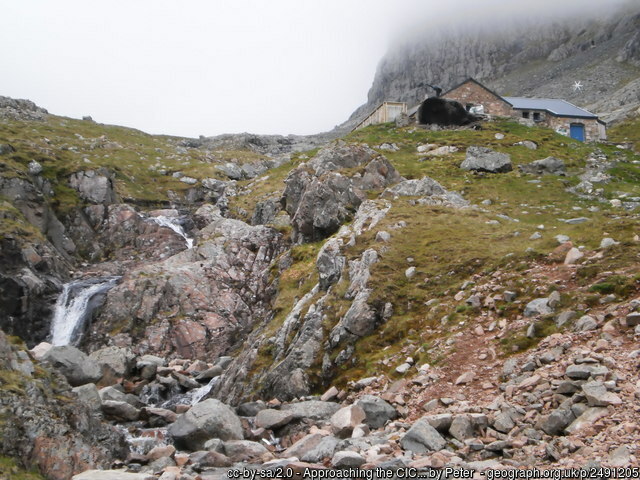 The last time I had been to the hut was in January 2011 when I was on an Avalanche Awareness course run by mountain guide (and all round nice guy) Tim Blakemore. 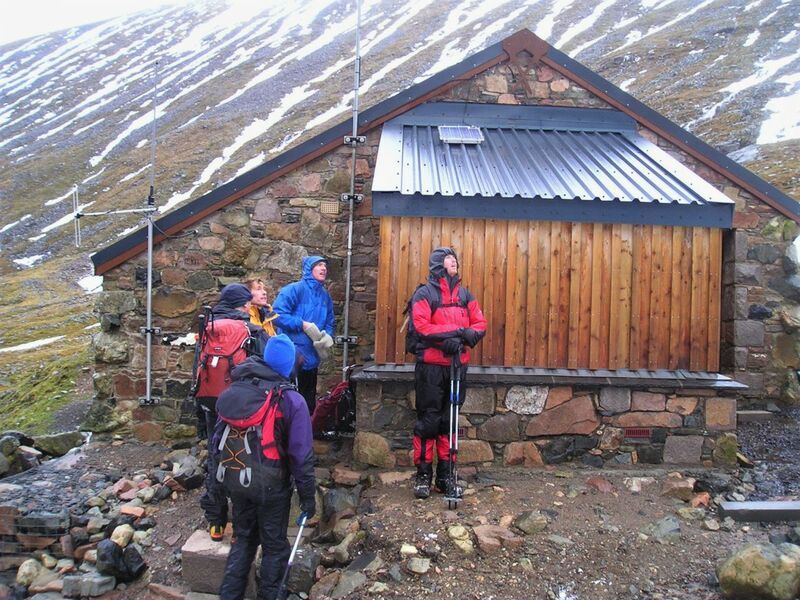 The hut was erected in 1928-9 by Dr and Mrs Inglis Clark in memory of their son Charles Inglis Clark who was killed in action in the 1914-1918 War, but is only open to members of the Scottish Mountaineering Club and other affiliated clubs. 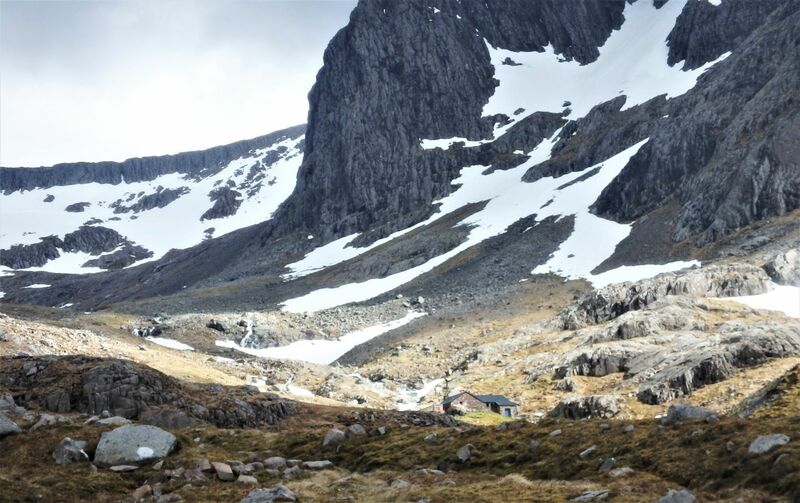 Access is strictly controlled, with many tales of cold, exhausted climbers being refused entry (to be fair, I’ve also heard of tented climbers being invited in when the hut is quiet). 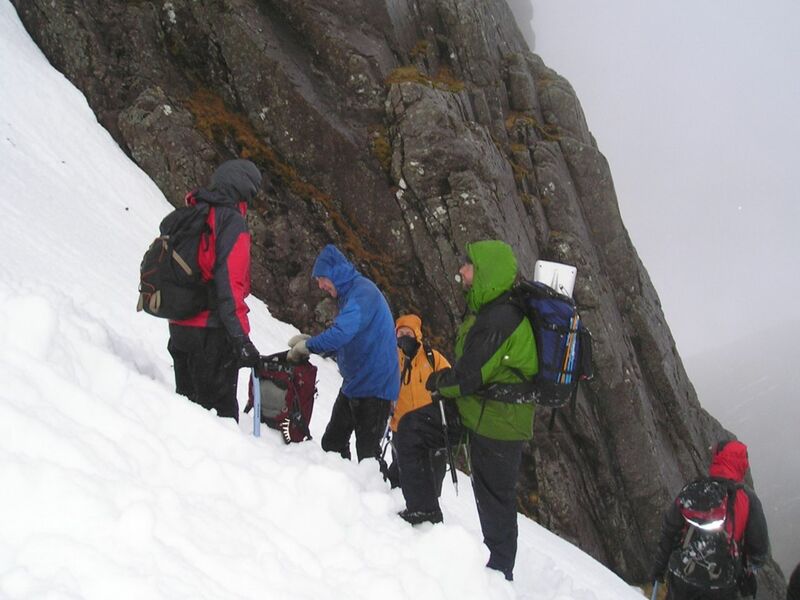 The members of the course had legged it up to the hut to do some practical stuff on digging snow pits to assess the avalanche risk, but a brew inside the hallowed walls of the CIC (courtesy of Tim, who had a key) had been a chance for a final briefing out of the rain and wind. 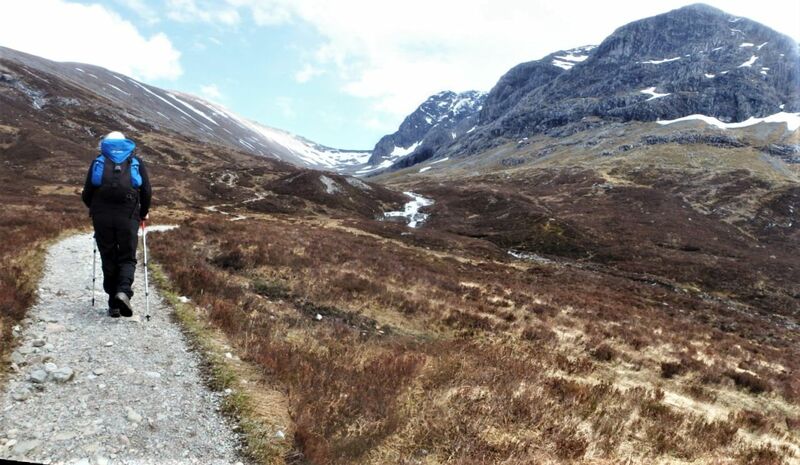 Chris and I started out from the North Face carpark near Torlundy, just north of Fort William. 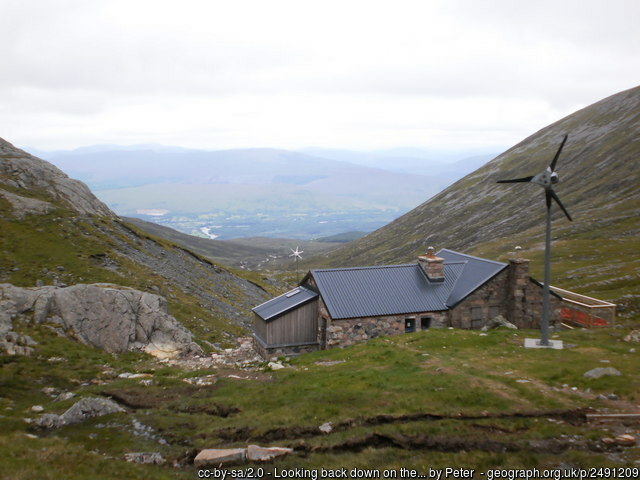 Ben Nevis needs no introduction to regular hill-goers and mountaineers as it the UK’s highest peak at 1345 metres (4,411 ft), but most days on The Ben start near sea level – our start point was a mere 40 metres in altitude, but we were only heading for the CIC Hut, which at 680 metres is only half a Ben Nevis. Skier …. On a bike! 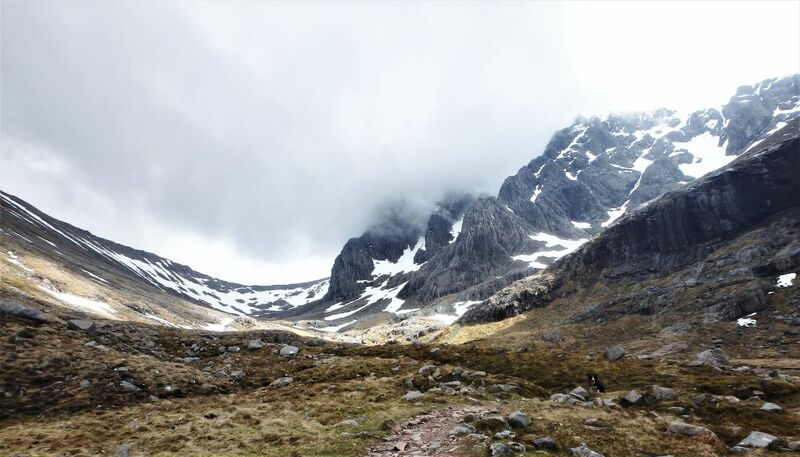 Visitors from abroad must wonder what the fuss is all about with a mountain only 1345 metres high, but if the Ben doesn’t have altitude it does have latitude, and the mountain is further north than Moscow. In this case, latitude translates as attitude, and the climate at the summit is Arctic in winter. No wonder there were skiers making their way down the track! 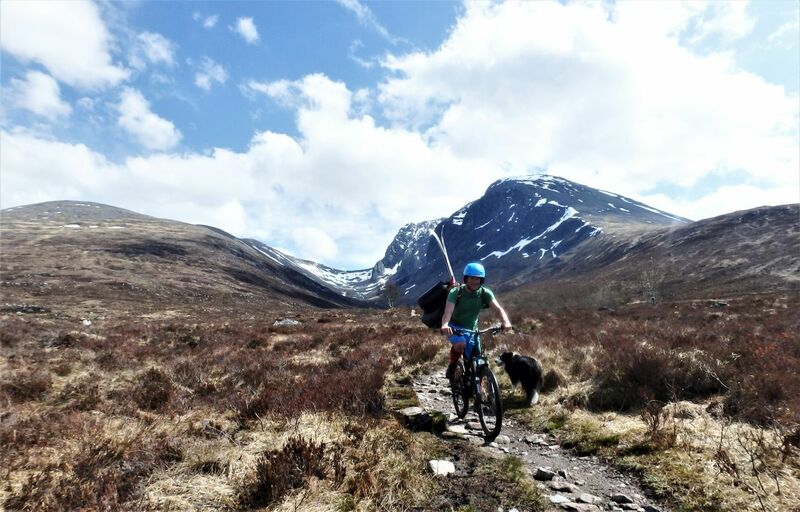 We chatted to one of them, who was cycling back down the track with skis on his rucksack (those who know the area would probably be as impressed as I was!). 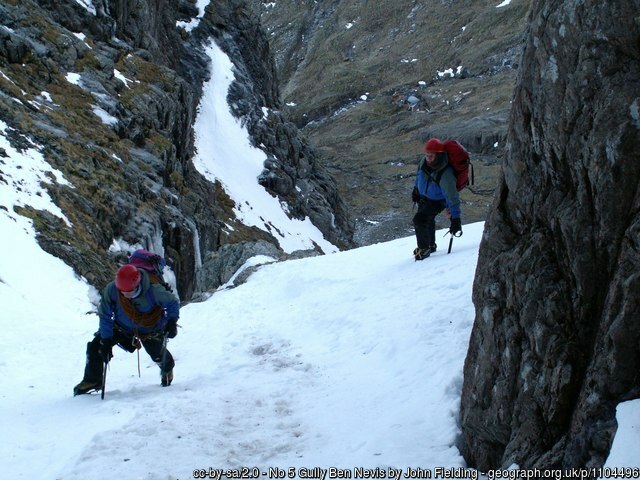 A group of skiers had spent a couple of days at the CIC, getting in some late season fun – I asked which bit of the mountain they had skied, and was gobsmacked to hear they had been in No 5 Gully. 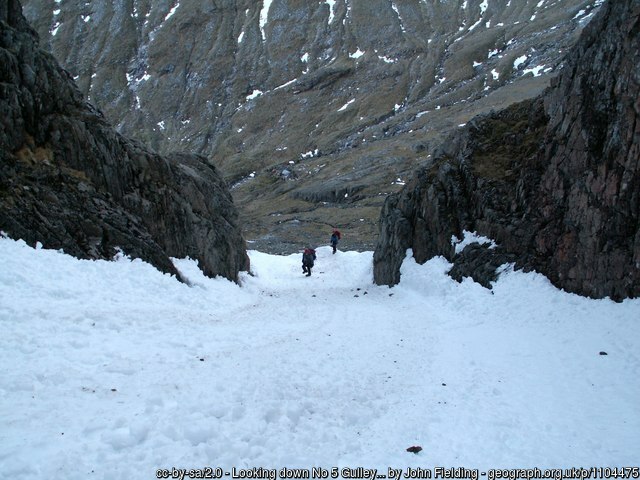 The gully is one of the easiest snow climbs on the Ben, but that doesn’t mean it isn’t steep – the photos will give an idea! …. 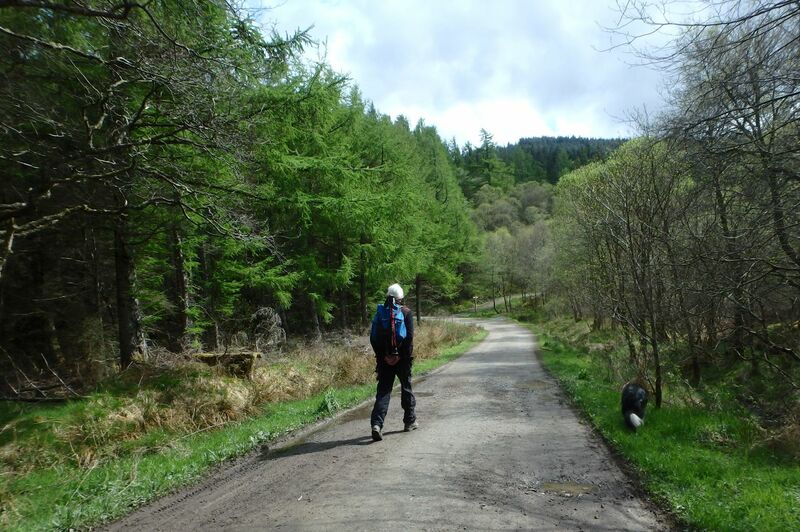 with the start point way behind …. …. but we aren’t moving fast enough for ‘Mist’! 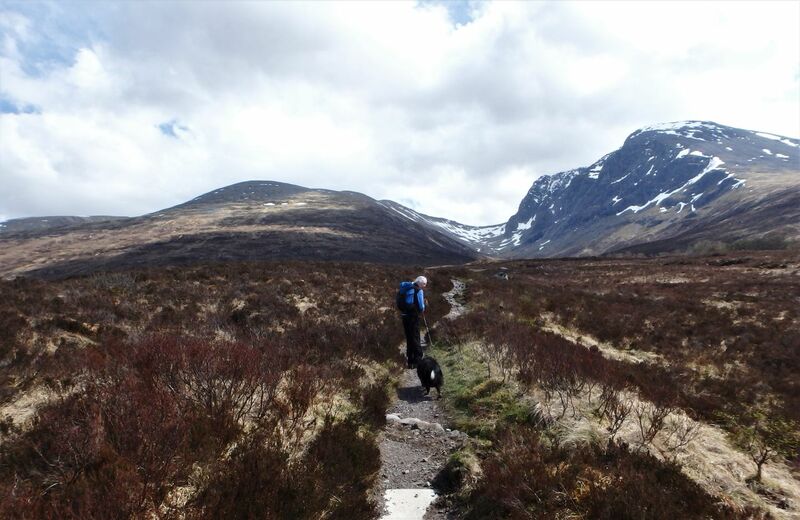 The last bit of the walk in …. 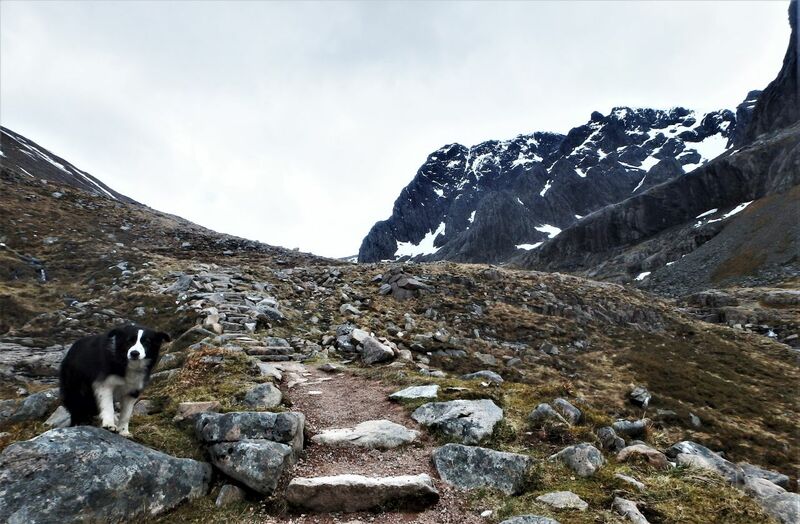 As we were only going up half a mountain, we were in no rush, which didn’t impress Border Collie ‘Mist’, who doesn’t make allowance for the fact that two-legged humans are not as fast as four-legged collies. 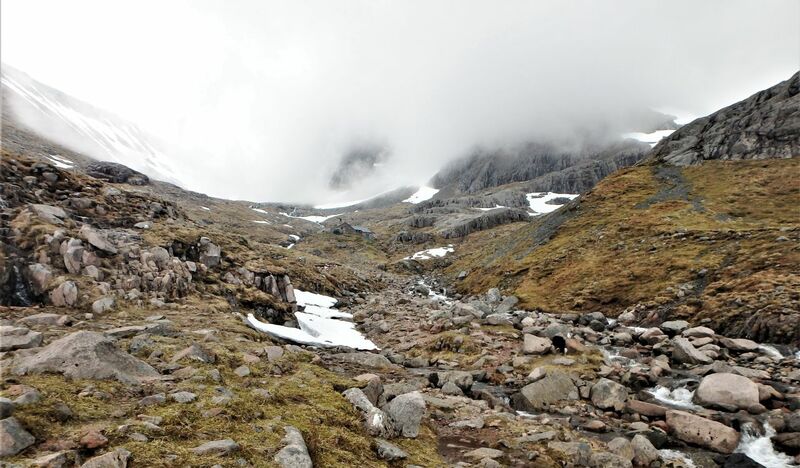 The cloud began to descend as we followed the last bit of the walk-in, shrouding the high cliffs of the North Face. Finally, the hut came into view, with only the stream of the Allt a’ Mhuilinn (it translates as ‘Mill Stream’) remaining as an obstacle – the water was slightly higher than usual but passable, but Chris wasn’t inclined to risk a soaking. 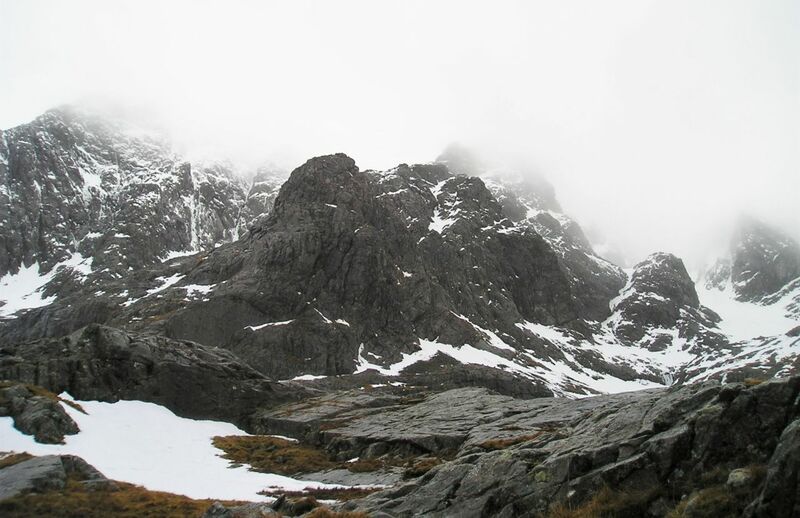 We soaked up the atmosphere instead, with the magnificent Tower Ridge looming above. 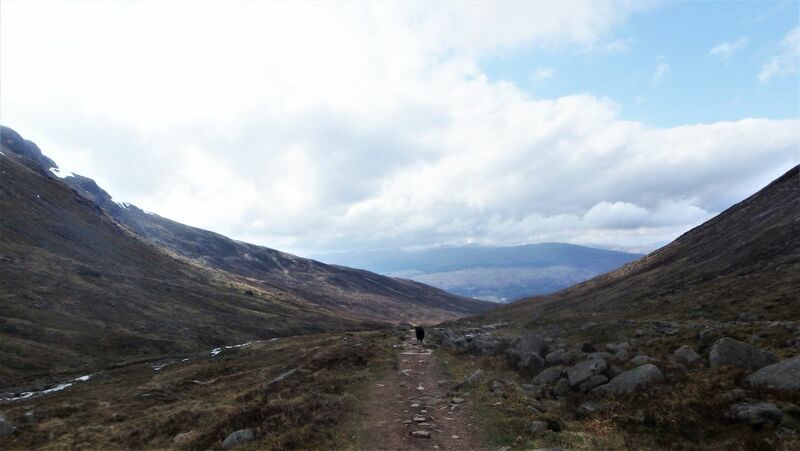 Then it was time to head down, with a hungry Border Collie even further in the lead than usual.